Tennis courts—they’re a centerpiece for sports centers, parks and neighborhoods and they keep people active. They bring in clients, tenants and buyers, and more often than not, they are paved with asphalt. Asphalt makes a great tennis court paving surface for many reasons—just as tennis courts make great additions to towns, parks and communities. If you’re thinking of installing one near you, call Espina Paving at (703) 491-9100 to talk about asphalt pavement for your tennis court. Why Should You Use Asphalt Pavement for Tennis Courts? Asphalt is a great choice for people who want a no-fuss tennis court to play on, year in and year out. It’s tough, resists the harshest climatic elements, can handle a lot of sweat without breaking a sweat. That said, a little TLC on your asphalt tennis court will go a very long way to keeping repair costs way down. An annual light pressure wash, prompt removal of any dirt and debris and keeping heavy equipment off of the court are important ways to protect your tennis court and tennis players. Also, immediate repair of any cracks and a 5-year resurfacing schedule should keep those tennis balls bouncing happily for many, many years. Of course, for tennis enthusiasts, the surface itself is extremely important to the game. And we should add that the type of asphalt mix used for tennis courts and the type used for parking lots are not the same. In fact, the mix can be customized to your specifications, based on the type of play your court will see and how fast you want the ball to go during play (it all depends on how much sand is in the mixture). There is a bit more give in the asphalt tennis court and the pavement is porous to improve drainage and prevent skidding. During the initial paving phase of the tennis court, the grade, slope and drainage are painstakingly evaluated, adjusted and customized to the location so that the surface is completely smooth and even. We also flood the base asphalt layer after the 2-week long curing process just to make sure that water drains off evenly and that there are no areas of ponding left before we get down to further customizations. The customization process also involves laying down the colored, rubberized surfaces that go on top of an asphalt tennis court. Any colors you want to use can be used, and the amount of layering depends on what you need. 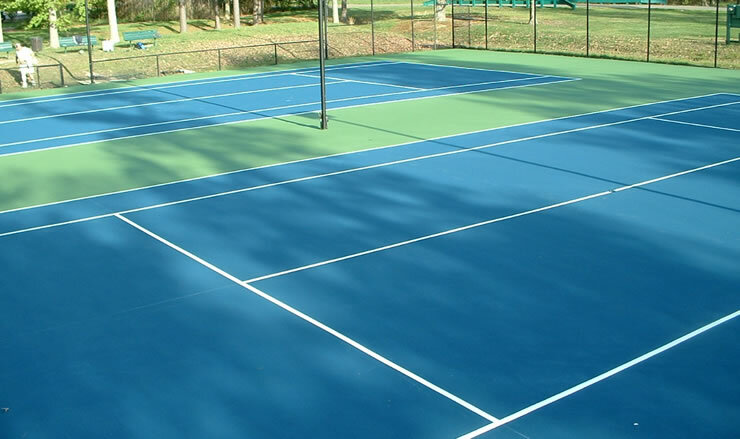 Asphalt paving for tennis courts is really the way to go if you’re thinking of adding tennis courts to your property. And if you are thinking about this great addition to your location, contact Espina Paving today at (703) 491-9100 to schedule an appointment for us to come out and evaluate the location and discuss your options with you!